This project has been to raise awareness of the plight of the Atlantic Salmon. We have worked closely with the River Dee Trust who have an educational programme in local primary schools. We visited 4 primary schools where children used clay to make life-sized 'parr' - salmon in one of the earlier stages of their lifecycle. Classes at Heckleburn for adults gave people the chance to learn about the anatomy, physiology and life-cycle of the salmon, and to make their own ceramic 'smolt'. Local artists were invited to decorate larger salmon for sponsors of the project. There are still a couple of 'Bars of Silver' available for sponsorship - please see photographs below. 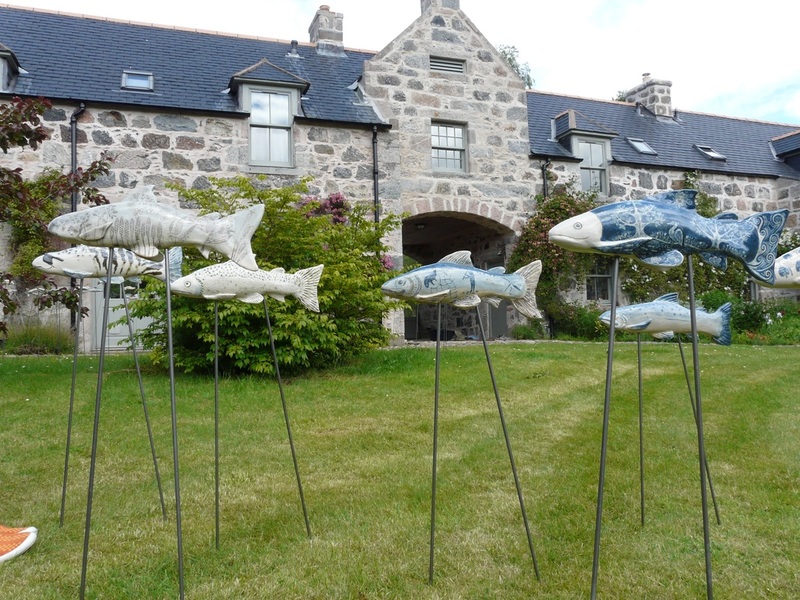 The installation of over 230 ceramic salmon opened at Banchory Lodge Hotel on Tuesday 9th June. On Friday 19th June it moved to Buchanans Bistro at Woodend Barn, Banchory. There is an exhibition about the making of the fish in the Woodend Barn Gallery until 16th July 2015. The installation moves to the Tower Garden at Balmoral from 6th to 20th July, and it will be on display at Heckleburn, Banchory from 12th to 20th September.